The northeast of India evokes images of rain-soaked valleys and mountains, stretches of tea plantations as far as the eye can see, thriving tribal culture in the 21st century, and pristine landscapes. Visiting the northeast of India is a great travel option and there is so much to do in this part of India. 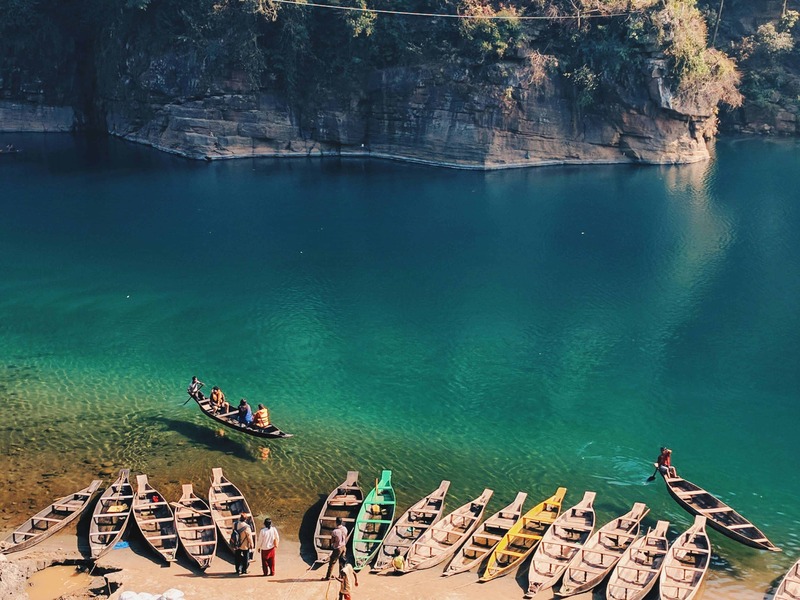 In continuation of the Talk Travel Northeast India travel guide series, in part 3 we will tell you what to do in Meghalaya and Nagaland. Read about Sikkim, Arunachal Pradesh, and Assam in Part 1 and Part 2 series. Know more about Manipur, Tripura, and Mizoram in part 4 of the Northeast of India series. This state in the northeast of India is famous for being the wettest place on the entire planet. Go visit Meghalaya to enjoy the incessant rainfall during monsoon, walk over the living root bridge and take a dip in the crystal clear waters of the Umngot river in Dawki. You can visit Meghalaya any time of the year. Especially if you want to visit the village of Mawsynram which receives the maximum rainfall in this world. For a more comfortable experience, you can visit Meghalaya anytime between September to May when it isn’t raining. The weather can be humid here and can also rain anytime, so carry light cotton clothes to help absorb the sweat. Also carry a raincoat preferably when you visit Meghalaya. An umbrella is good too but there is hiking involved at a few places. The terrain is such that, you cannot walk holding an umbrella in one hand over such long distances. Good hiking shoes or sports shoes. As mentioned before, a lot of walking is involved, so a good pair of shoes is important, preferably water-proof. You are on an adventure in Meghalaya where you will hop over rivulets, cross live root bridges and trudge through ankle-deep water sometimes. There is a tiny airport 30 km outside the capital called Shillong. This airport receives flights only from Kolkata. Another more convenient and better option is to fly to Guwahati in Assam and then take a taxi to come to Shillong. There are a lot more flights which reach Guwahati from New Delhi, Mumbai, Kolkata and more. Guwahati is just 100 km from Shillong and a taxi ride is comfortable and very scenic. The nearest railway station is again in Guwahati. Reach Guwahati by train and then take a taxi to Shillong. There are a lot of things to do in the capital of Shillong itself. Exploring Shillong deserves 3 days in itself, such is the charm of this city. Don Bosco Centre for Indigenous Cultures (DBCIC) is spread over 7 floors showcasing the diversity in culture in the northeast of India. The exhibits on display are curated and each depicts the history, culture, tradition and more of the people in this region. A must-visit if anthropology is your thing. Just 12 km outside Shillong is a beautiful cascade of white water. The water cascades over three levels and you have to climb down the stairs from the top to see each level. Appreciate mother nature at its best 15 km outside Shillong at Umiam Lake. This lake is basically a reservoir upstream of the Umiam river. It is the perfect place to go for a picnic, boating or kayaking. This is a simple 17 km hike for 6 hours which takes you through some spectacular scenery. This hike is simple but suggested for able adults. This is because sometime you will have to cross a stream in waist-deep water. Read more about this hike here. 22 km from Shillong is this scenic place called the Laitlum Canyon. The trek to the top of the hill is between moderate to difficult but well worth the effort as you will be rewarded with views of the valley beneath you. You can also go on a bike or a taxi to the top of the hill. There is a 3000 stepped stairway which leads to a hamlet called Raslong beneath. In your path, you will find bamboo plantations and colorful orchids. This is a tiny village 25 km outside Shillong. This is village is the hub of Khasi culture, an indigenous ethnic group in Meghalaya. While you are here, you must go for a hike in the Sacred Forest here. 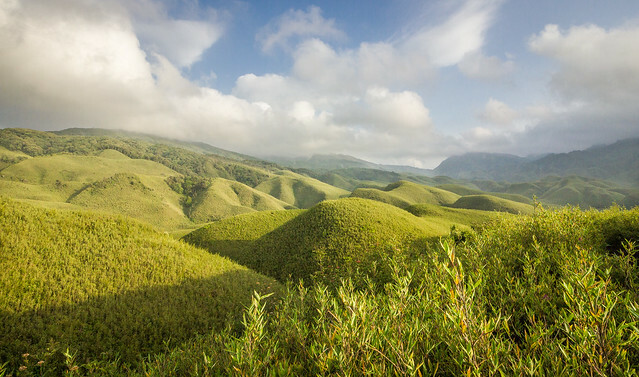 The local Khasi tribes have been protecting this jungle from centuries and they consider it as sacred. There is also a very interesting and quirky rule while you are here, which is – ‘You are not allowed to take anything out of the forest.’ Not even a pebble, a twig or a leaf as it is considered to anger the Gods. There is a belief that if a person does take something out secretly, they tend to fall ill. Whether you are a rationalist or not, get into the groove of the local culture and enjoy this hike by taking only memories back with you. It is a world-renowned village because it receives the highest rainfall on Earth. When you are here, you can also visit the naturally formed Mawjymbuin Cave. It is a village 100 km from Shillong in the south of Meghalaya, close to the Bangladesh border. This village is famous for being the cleanest village in Asia. It is a picturesque village with spotless roads. The houses are made of natural materials like bamboo and surrounded by flower-bearing plants. There are bamboo baskets placed everywhere which serve as dustbins. This is a high altitude town in Meghalaya. This place receives heavy rainfall second to Mawsynram. Cherrapunjee‎ is famous for its mountains, waterfalls, caves and the famous living root bridge. The south of Meghalaya has a lot of gems to visit like the Nohkalikai falls. 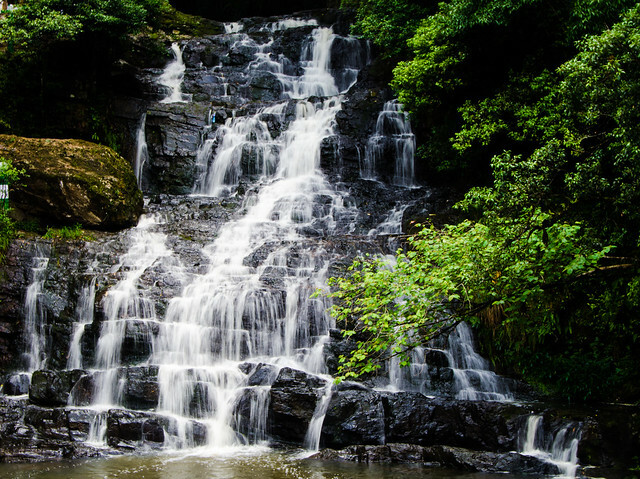 Around 55 km from Shillong, this waterfall is one of the highest in India with water plunging from a height of 1100 ft. It is a spectacular sight to see a white stream of water plunging from a rocky plain full of trees. The living root bridges of Meghalaya which are famous world over are from the village of Nongriat. 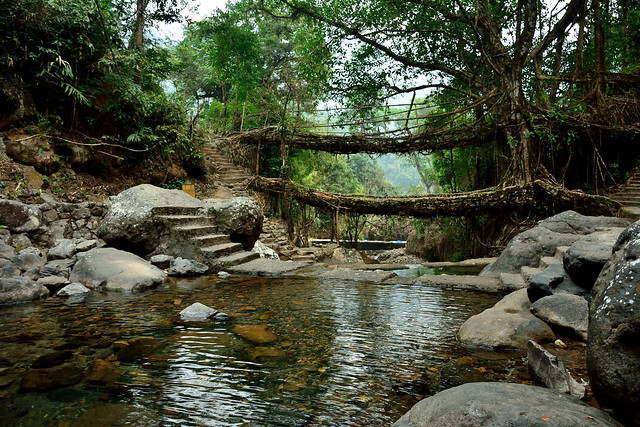 These roots are built by the Khasi tribes who guide the aerial roots of trees to grow in a certain direction which transforms into a sturdy bridge when they grow. It is such rare landmarks that make travel in the northeast of India such a delight. You need to trek down a total of thousands of steps down the mountain to witness the double-decker root bridge. The trek will take approximately 5 hours to complete one way. It is best suggested to stay overnight at the base of the mountain where there are accommodations. It may be physically exhausting to hike down thousands of steps but the scenery that you get to witness is priceless. You will see lush greenery, gushing rivers, fluttering butterflies, and more. If you plan to stay, walk around on other trails to nearby villages and take a dip in many waterfalls along the way. Also, trek up for an hour to Rainbow Falls, which is supposedly very scenic and highly recommended by all trekkers and locals alike. Carry your best shoes as you will be on your feet for the most part of the day. Also, carry swimming wear if you would like to take a dip in the stream here. Read this blog by Lost with purpose where he put into words his experience at Nongriat. There is the Kynrem Falls, Seven Sisters Falls, Mawsmai Cave, Daiñthlen Falls, Arwah cave, Wei Sawdong waterfall and more. Meghalaya can easily take a week’s time to explore during your trip to the northeast of India. While we spoke of waterfalls, bridges and villages, a trip to Meghalaya is incomplete if you do not go to Dawki. 95 km from Shillong and just 2 km away from Bangladesh, the biggest attraction is the Umngot river. The emerald green water of this river is so crystal clear that you can see the riverbed 12 ft below. You can take a take a boat ride, swim in the water, go fishing, have a meal of freshly cooked fish or just appreciate the beauty of this border town. Close to the border of Bangladesh flows the river Jadukata which has an abundant population of Mahseers. If you love fishing then this is the best place to be. Anglers can row up the river where the Kynshi and Rilang rivers converge to enjoy angling. You can find golden mahseers, golden carp, silver carp and the common carp. Hidden among the mountains, Nagaland in the northeast of India shares its border with Myanmar on one side. Nagaland is famous for its diverse indigenous tribes in exotic attire, vibrant festivals, and beautiful valleys. Nagaland is a year-round destination. Summer between May to July can be hot and humid. Winter between December to February is cool during the day and cold during the night. Monsoon is a good time to travel too but it can rain very heavily so please carry your raincoat when you are in the northeast of India. The capital of Nagaland is Kohima but the city with has all the connectivity is Dimapur which is 67 km away. Dimapur has an airport which receives frequent flights from New Delhi, Kolkata, Guwahati and other major Indian cities. The nearest railway station in Dimapur is well connected to Guwahati and other cities within India. There are good roads but the distance to cover is large and the terrain is mountainous. So stick to flying or taking the train for your own safety. The Kohima War Cemetery is a must-visit. It is a memorial dedicated to soldiers in the British unit as part of the Allied forces during the Second World War. It is at this spot that the Allied Forces won a battle against the Japanese forcing the latter to retreat. If you want to get into the details of the tribal culture of the Naga people, then the Naga Heritage Village is the place to be in Kohima. It is a popular weekend getaway for people living in n Kohima. Perfect for a hiking trip up the hill to enjoy breathtaking views and pleasant weather. Visitors trek all the way to the hilltop, to get a scenic view of the surrounding areas – including parts of Mt. Japfu (second highest peak in Nagaland) and a panoramic view of Kohima town. This annual 10-day event is a much-awaited festival in the northeast of India. It takes place in the month of December where 16 native tribes of Nagaland come together and showcase their rich culture and tradition. Tribes from other states in the northeast of India participate in this event. You can read more about this festival and its features on the official Nagaland tourism website. 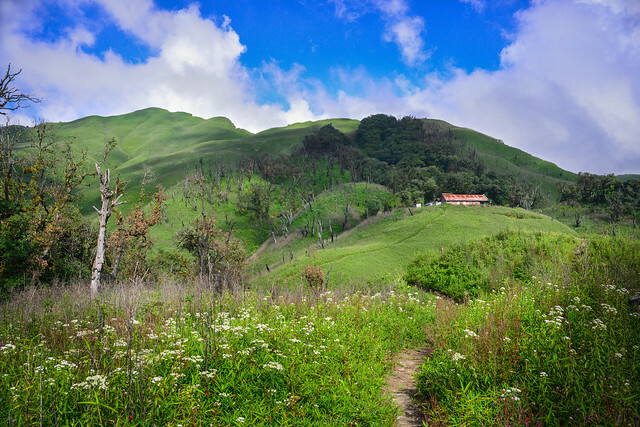 This is a very charming valley which will provide you generous views of the emerald green hills, lush forests, meandering streams, and a riot of colors with flowers blooming along the trekking path. Such a fantastic experience is what awaits you in the northeast of India. The trek is moderately difficult since there are steep ascents to climb in the forest. You can go for a hike organized by Thrillophilia. It makes for a better experience as your guide will explain the local culture, the lifestyle of villagers and more. There is an ecotourism company called The Greener Pastures completely dedicated to promoting sustainable travel in Northeast India. They promote tours and adventures to exotic locations in the northeast with an objective to benefit local communities and safeguard the environment with responsible travel. They conduct guided tours in this region which will give you a great insight into the lives of the people, culture, heritage, and landscape of this region. We hope this guide helped you get a fair picture of what places to visit in Meghalaya and Nagaland. Read Part 1 of the Northeast of India travel series to know all about traveling in Sikkim. Part 2 is about Arunachal Pradesh and Assam. Last but not the least, part 4 is about travel in Manipur, Tripura, and Mizoram.